Madrasa ben Youssef was named after the Almoravid sultan Ali ibn Yusuf (reigned 1106–1142), who expanded the city and its influence considerably. 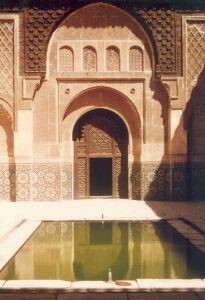 It is the largest Madrasa in Morocco. The college was founded during the period of the Marinid (14th century) by the Marinid sultan Abu al-Hassan and allied to the neighbouring Ben Youssef Mosque. 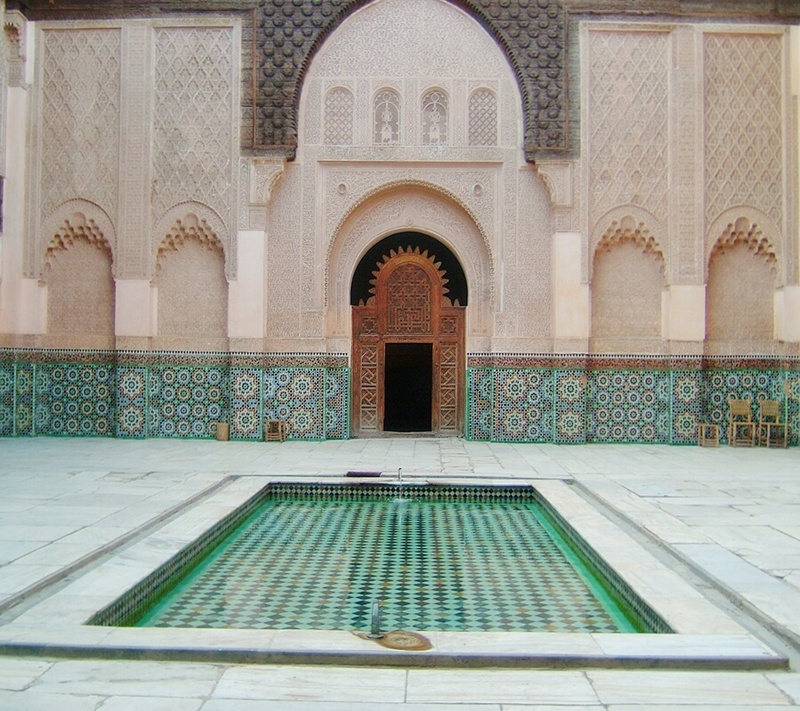 The Ben Youssef Madrasa was re-constructed by the Saadian Sultan Abdallah al-Ghalib (1557–1574). In 1565 the works ordered by Abdallah al-Ghalib were finished, as confirmed by the inscription in the prayer room. Its 130 student dormitory cells cluster around a courtyard richly carved in cedar, marble and stucco. The carvings contain no representation of humans or animals as required by Islam, and consist entirely of inscriptions and geometric patterns. MADRASA B EN YOUSSEF was one of the largest theological colleges in North Africa and may have housed as many as 900 students. One of its best known teachers was Mohammed al-Ifrani (1670-1745). “I had a day and a half in Marrakesh, and according to Travel Adviser this was a site not to miss. As usual, it was right. I love the architecture of holy places and have visited mosques and places of a spiritual nature in all the Muslim countries that I have visited. This Madrasa is a jewel … assuming you can find it because it’s buried in the principal Medina souk. I went with a personal guide who knew exactly where to go. For whatever reason (it is the onset of winter in Morocco and cold), there were not the hoards of visitors reported by other commentators here.